Billie Holiday: A Singer Beyond Our Understanding Most artists belong to their times. But Holiday, born 100 years ago Tuesday, fits in the present. 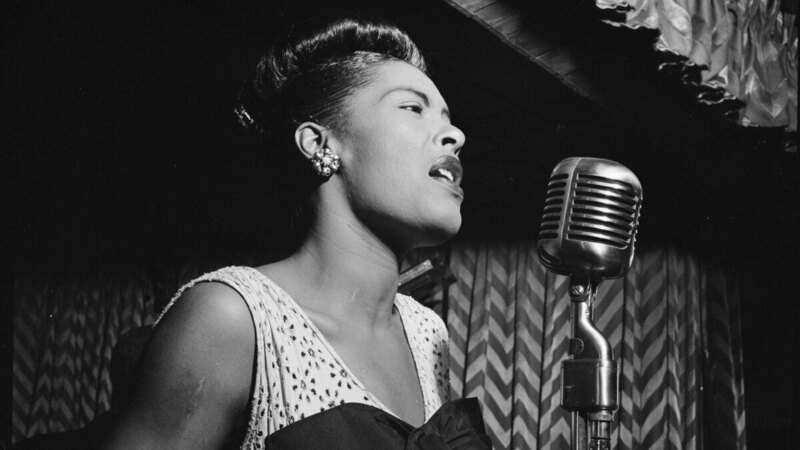 Billie Holiday has become a mythic presence in absentia. Most artists belong to their times, but Billie Holiday, born 100 years ago Tuesday, fits in the present. In a way, she died before her time, just as the country was beginning to talk about race, drugs, feminism and misogyny — all of which converged in her life. Her death in July 1959 was only briefly noticed in the media. Few would have imagined then that the centennial of her birth would be an occasion for remembrance. But legends are about a state of mind, not a state of being, and some thrive best when they're not in competition with a living person. This is especially true of Holiday. There was something special about her. Jazz musicians and some fans heard it, and so did a young record producer named John Hammond. He heard an 18-year-old Holiday sing in a small club in April 1933. "I listened to this girl, and I just couldn't believe my ears that here was a singer who sounded like an instrumentalist, like one of the most advanced instrumentalists there had ever been," Hammond once said. "So I started talking to Billie, and Billie had had a fairly checkered career by then. She'd been in jail and everything. And Billie had already been arrested for prostitution at 14." In 1935, Hammond began recording her with pianist Teddy Wilson, who put together small jazz groups that included some of the best musicians in New York: Lester Young, Benny Goodman, Ben Webster. They sold well enough. And by the late 1930s, she had made more than 100 records. But in 1938, in the prime of her career, she ranked only 14th in the annual Down Beat reader poll. Many didn't know her name, even at Harlem's Savoy Ballroom. In 1939, Holiday heard a song called "Strange Fruit." But the recording label Columbia refused to record it, so she made it for a tiny jazz label. It was a slow, somber, frightening dirge about an unspeakable topic — lynching. "Strange Fruit" changed Holiday from a jazz singer to an actress. Her performances became small, intimately structured theater. She played herself, sitting on a stool in a pin spotlight with a gardenia in her hair. The rest of her life became a theater of self-destruction. Her albums became increasingly difficult to listen to as her voice hardened into a gnarled cackle. She forgot lyrics. She lost her confidence. In July 1959, she died in a New York hospital, under arrest on drug charges and cuffed to her hospital bed. The New York Times ran a short, un-bylined obituary on page 15. She was 44 and left an estate of $1,000. Her greatest work of the '30s was mostly out of print. Soon, all that was about to change. Holiday's renaissance began quietly. In 1961, she was voted to the Down Beat Hall Of Fame. Soon after, Columbia restored nearly 100 of her greatest early records. In the '70s, Diana Ross won a Golden Globe and received an Oscar nomination for her portrayal of Billie Holiday in Lady Sings The Blues. Holiday's 1941 recording of "God Bless The Child" entered the Grammy Hall of Fame in 1976. There would be another 22 posthumous Grammy wins or nominations associated with her work. In 2000, she was inducted into the Rock And Roll Hall Of Fame. Now, more than half a century after her death, every record she ever made is in print. Great talents who court their own doom are forever fascinating to us, because they seem beyond our understanding. Maybe that's why Holiday became the mythic presence she is in absentia. That presence loomed larger than ever last year, when Audra McDonald brought it to Broadway in Lady Day At Emerson's Bar & Grill. McDonald accepted her sixth Tony Award on Holiday's behalf. "I want to thank all the shoulders of the strong and brave and courageous women that I am standing on ... and most of all, Billie Holiday," McDonald said in her acceptance speech. "You deserve so much more than you were given when you were on this planet. This is for you."